Amphibious assault ships look like scaled-down aircraft carriers. BAE Systems San Diego Ship Repair plans to modify the flight deck of the USS America to better accommodate the new F-35B Lightning II aircraft. Four of the new aircraft are visible at far left. Photo courtesy of Lockheed Martin Corp.
San Diego  A new model of aircraft coming to U.S. Navy ships means work for San Diego’s shipyards. The new aircraft is the F-35 Lightning II, also called the Joint Strike Fighter. One of its three versions is similar to the Harrier Jump Jet, in that it can land vertically and take off in a very short distance. BAE Systems San Diego Ship Repair will soon adapt the amphibious assault ship USS America for the F-35. F-35B Lightning II aircraft operate on the USS America in November 2016. The aircraft has special equipment that lets it hover and land vertically. Photo courtesy of Lockheed Martin Corp. The America, which returned from its first deployment Feb. 2, was commissioned in 2014. In addition to hull, mechanical and electrical repairs, BAE will provide flight deck modifications to support F-35 operations. Work is scheduled to run through December at Naval Station San Diego on 32nd Street. Meanwhile, General Dynamics NASSCO is hoping to get work modernizing the USS Bonhomme Richard, an older, Wasp-class amphibious assault ship that has been stationed in Asia, and is scheduled to return soon. The ship, which was commissioned in 1998, needs modernization work that could not be accomplished overseas, said David Carver, NASSCO’s lead executive for ship repair. The Bonhomme Richard will need a “major structural upgrade” to support the weight and the heat associated with the F-35; heat travels down the bulkheads of the ship. In addition, shipyard crews will have to mitigate the noise of the F-35 and adapt the ship’s workshop to support the aircraft. The Lockheed Martin Corp. F-35B flown by the U.S. Marine Corps is a stealth aircraft with special hardware: a Rolls-Royce fan propulsion system at the front and a swiveling jet engine nozzle at the rear. The combination gives it the ability to use little or no runway; it’s what the military calls a STOVL (short takeoff and vertical landing) aircraft. 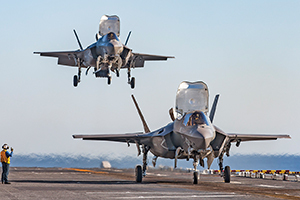 The Marines declared the F-35B fit for combat in mid-2015. Currently such aircraft are based in Yuma, Arizona. BAE Systems said on Jan. 31 that it received $54.8 million in contracts to modify the USS America as well as a smaller ship, the USS Cape St. George. If the Navy exercises contract options, the value of that work could grow to $62.2 million. The Cape St. George was commissioned in 1993. BAE Systems has a contract to alter and repair the ship, replacing critical aluminum structures and removing obsolete equipment under the Navy’s cruiser modernization program. Work is scheduled to run through January 2019. BAE will also modernize the guided missile destroyer USS Howard under a 15-month, $47.8 million deal, announced Jan. 3. In addition to hull, mechanical and electrical repairs, BAE will upgrade combat systems. Options could bring the work to $66.5 million. The Howard was commissioned in 2001. BAE was also recently selected to do $11.5 million of modernization work on the mine countermeasures ship USS Champion, which includes a period in dry dock. The Port of San Diego is unique in that its ship repair complex is completely private. There is no U.S. government-run shipyard in the area. The Navy operates an aircraft repair depot on North Island.